Kick off your summer with the University of Guelph at SummerFest on the Green! Come find OAC to get a taste of ice cream developed by the Department of Food Science or design your ideal planter box with the Department of Plant Agriculture. 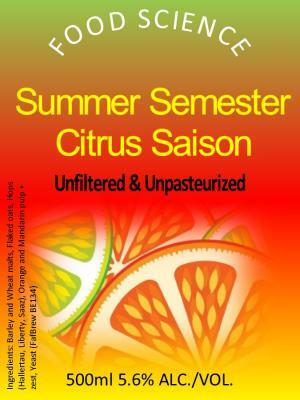 Citrus Saison Ice Cream, made with ice cream and beer made in the Food Science Department Pilot Plant. The Saison is a standard Belgian Style Farmhouse Ale made with 2-Row Malted Barley, Wheat Malt and Oats. Hops used were Hallertauer, Liberty and Saaz. The yeast was SafBrew Saison yeast BE134. Orange and mandarin zest and pulp were added to the secondary fermenter. The finished beer has characteristic spicy notes of clove and orange. The flavours of the beer carry over into the ice cream creating a light yet creamy and spicy dessert with a citrus finish. Waffle cones are hand made to accompany the ice cream and contain 25% spent grain recovered from the brewing process.